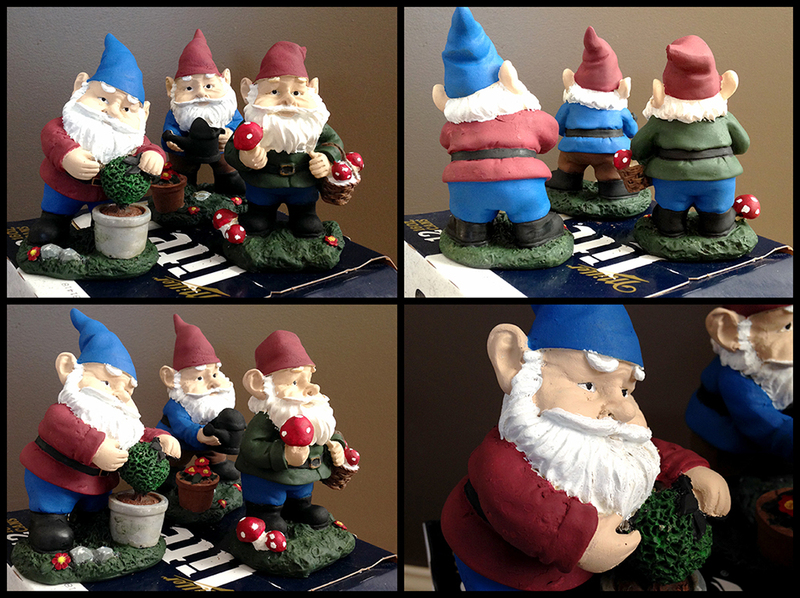 About seven years ago, I purchased some adorable garden gnomes. 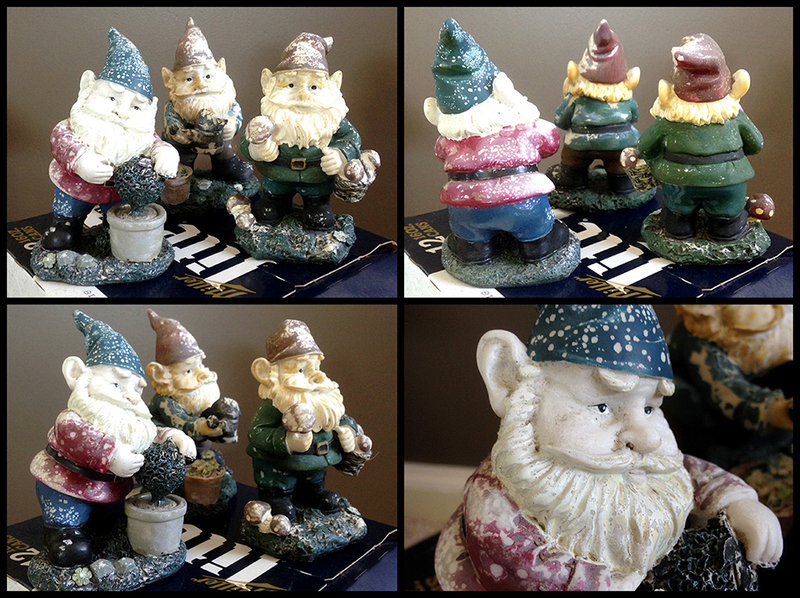 These little gnomes have lived in all sorts of flower pots and various places in my yard. Sadly, the sunshine had taken its toll and faded them. 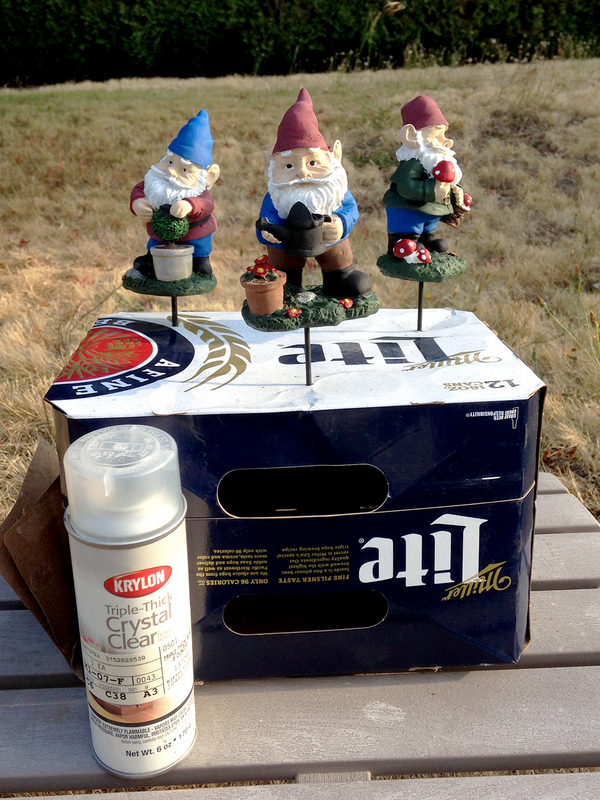 Because these gnomes have been with me for so long I was determined to rescue them and return them to the garden, good as new! The gnomes in their sun faded condition. To begin, I gave them all a quick power wash with the hose and a gentle scrubbing to clean off any dirt. I staked them in the grass to dry in the sun, which didn’t take long at all. 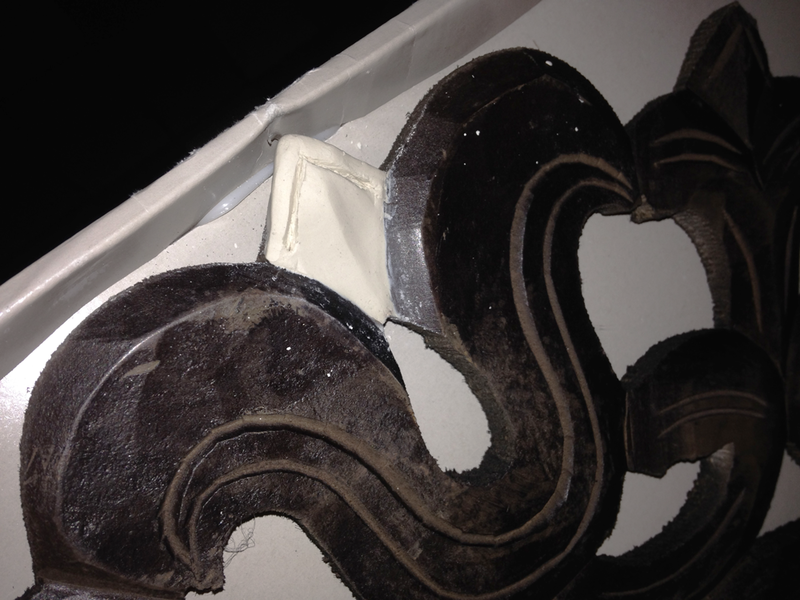 Next, I gathered them up and punched holes into a cardboard box so they had a place to stand while I worked on them. I used acrylic craft paints and brushes that I already had around the house. 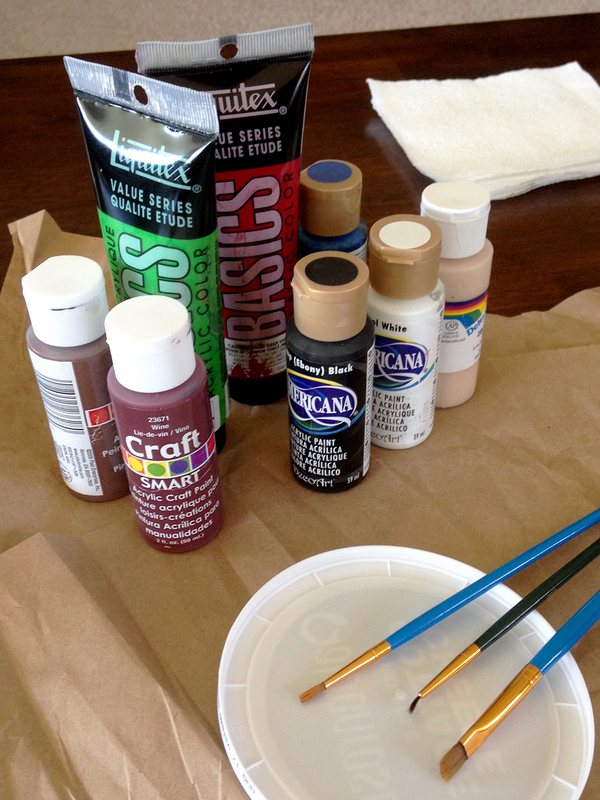 Other supplies included a plastic lid for mixing colors and a jar of water with paper towels to clean the brushes. With everything ready it was time to begin painting. 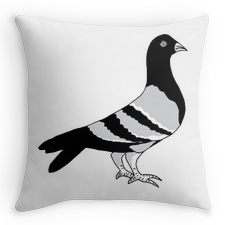 If you’re like me then you will spend hours being very precise with tiny brushes. I don’t mind spending a long time, with some t.v. in the background or an audiobook on, I find the time goes really fast! It might seem silly to spend hours repainting something that costs about $10, but I just can’t throw out things that can be fixed. Once the brightly colored gnomes were painted it was time to go bed. I let them dry completely overnight and then took them outside to spray with a clear protective coating. I grabbed my go-to spray, Krylon Triple-Thick Crystal Clear, and gave them a few coats. I was at the end of the can and ended up using another brand to add the final coats, but it worked out well enough. Now the gnomes are shiny and ready for more rain and sunshine! Knowing me, I’ll probably repaint them in a few years when they start to look sad again, but for now I will enjoy putting them back in their garden home. 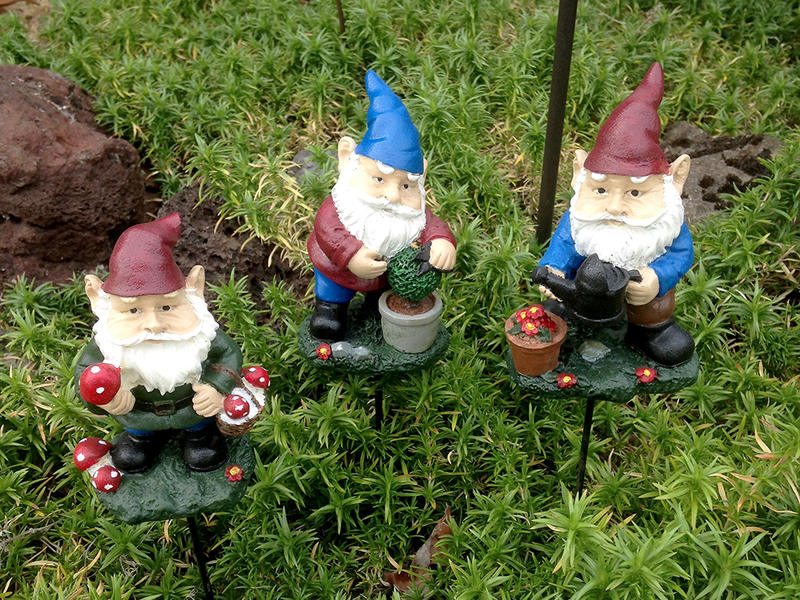 The bright and happy looking gnomes are back in the garden. 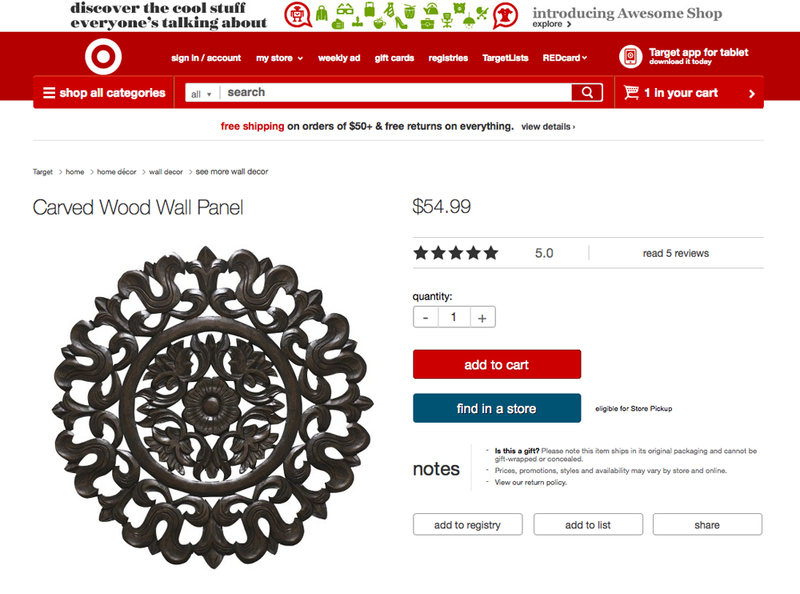 Author createdbyjessPosted on February 18, 2015 Categories UncategorizedTags air-dry clay, bargain hunting, wall decor, wood repair1 Comment on If it’s broke, buy it! 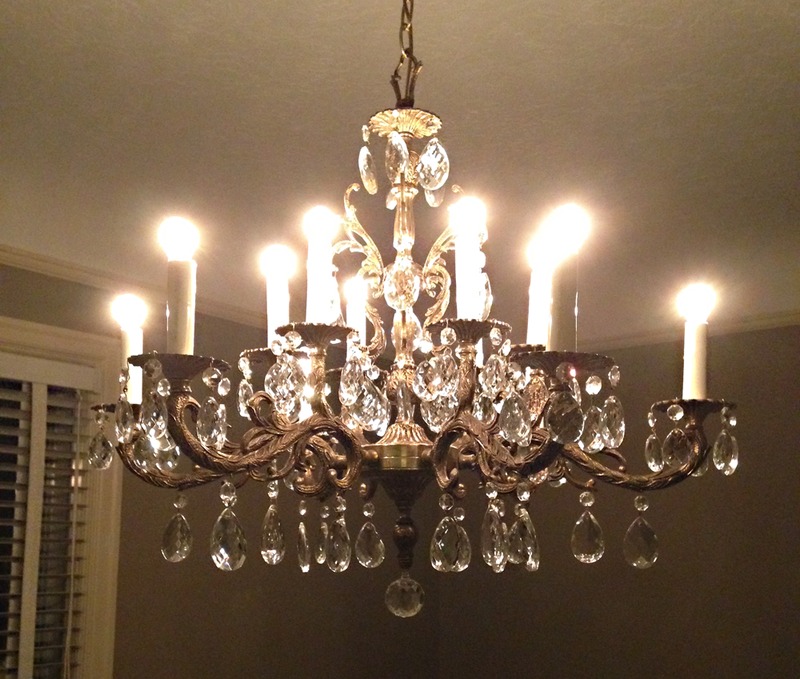 When we got our new house over a year ago, I was super excited about the chandelier in the dining room. It was dusty and had a ton of extra crystals hanging on the chain and a few missing here and there, along with a crystal at the bottom that I wanted to swap out. Since I was busy with school and we spent all of our free time painting and fixing things, the chandelier just gathered more dust. 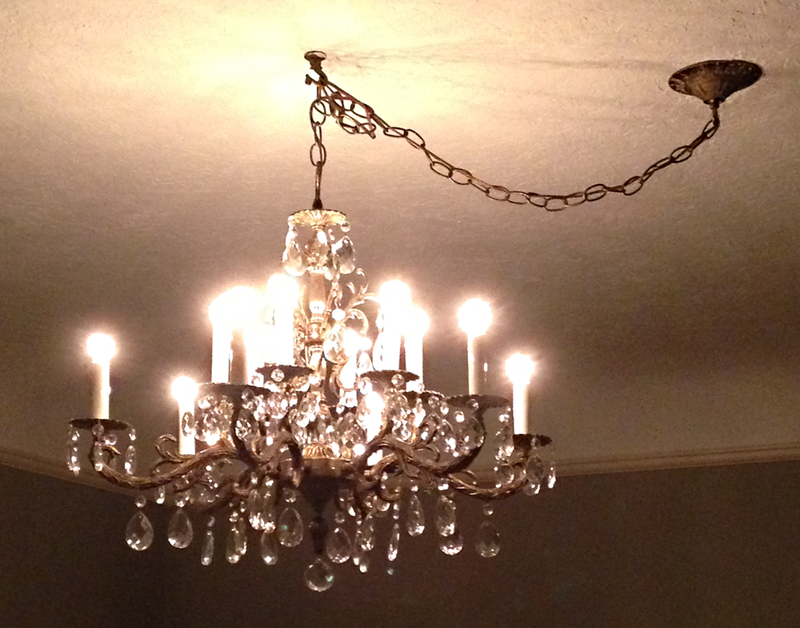 This picture of the chandelier is from when we first moved in. 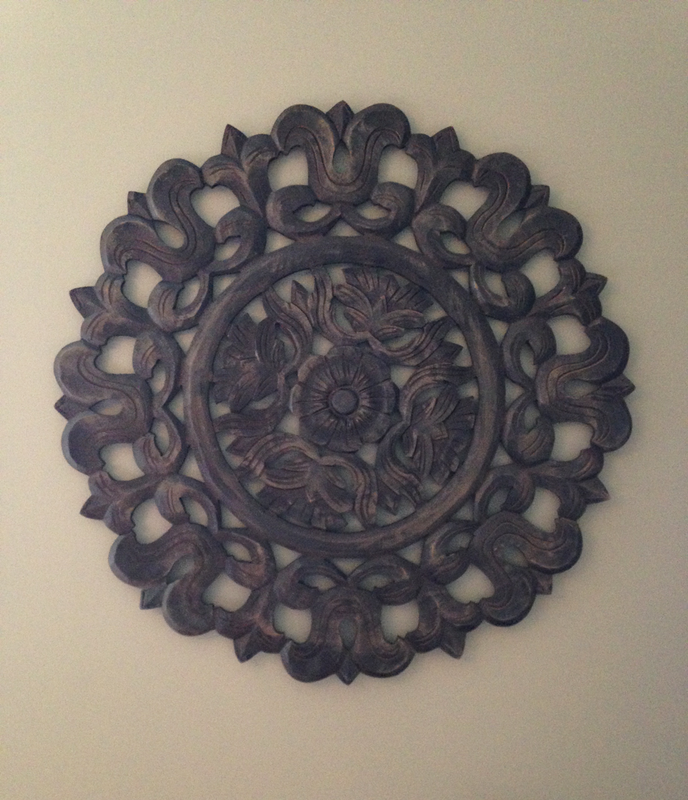 The way it was when we first moved in. I forgot to take one of the whole chandelier before I started cleaning it. Luckily, I at least got this shot of one of the candles so you can see how dusty it was! Shortly after moving in we swapped out the bulbs for much dimmer ones, you’ll probably be able to tell in the other pictures. Such a thick coating of dust! I had read about various cleaning products and methods but decided to go with plain water and a more hands on approach. I read how it was helpful to have several clean white socks or cotton gloves to really get the surfaces free of dirt. I chose to work from the top down and in small sections. This way I could wash a small set of crystals and put them back in place as I went. So, I removed the crystals from the very top section and starting with a damp sock on my hand I carefully wiped at the metal. I used a clean sock to gently dry the metal. 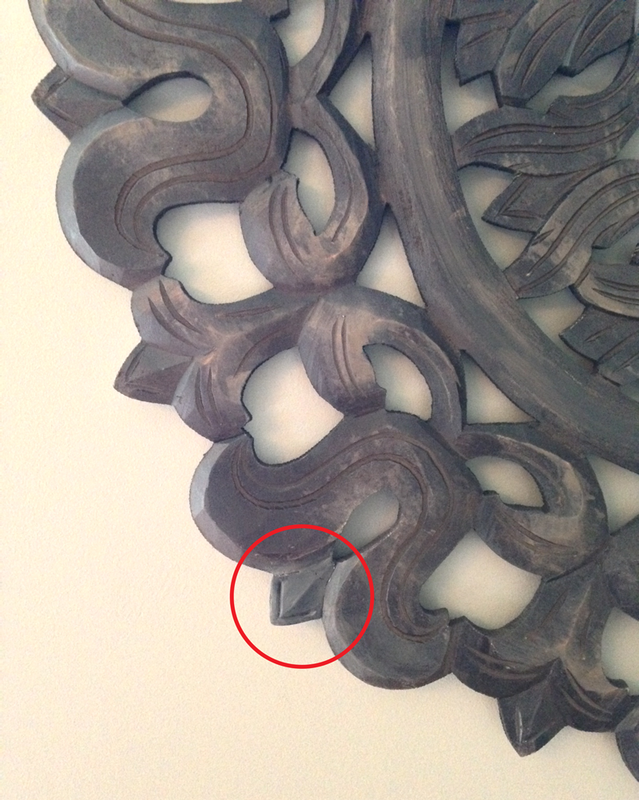 The red circle shows the crystals that had not been cleaned yet. You can really see a difference! When covered in dust they almost look like opaque plastic instead of the sparkling clear glass that they are. I removed a set of crystals and placed one at time in a small plastic bucket of water. Using my fingers I gently rubbed away at the dirt and then used a sock to wipe around the metal findings make sure they were clean. Then, I dunked the crystal into a separate container of water to kind of rinse it off. I laid each crystal on a towel to dry while I climbed up to remove the next section of crystals and clean the metal. Now the crystals I had washed were dry. I hung them back up and used a clean sock to wipe them in case they had gotten a fingerprint. I repeated this process for six hours before the entire chandelier was finished! 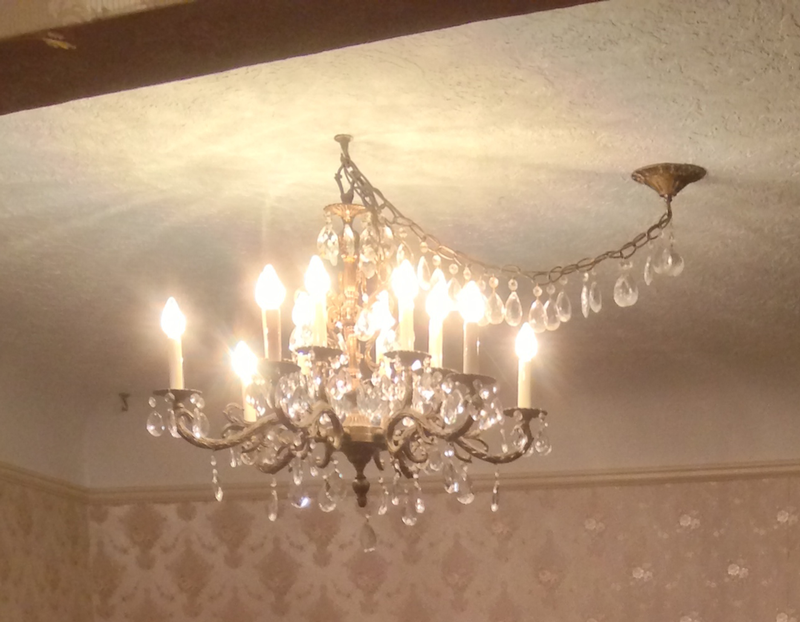 A close up of the now brilliant chandelier! 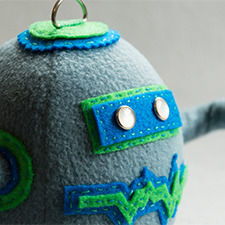 I added the five missing crystals to the bottom of the arms using the spares from the swag. 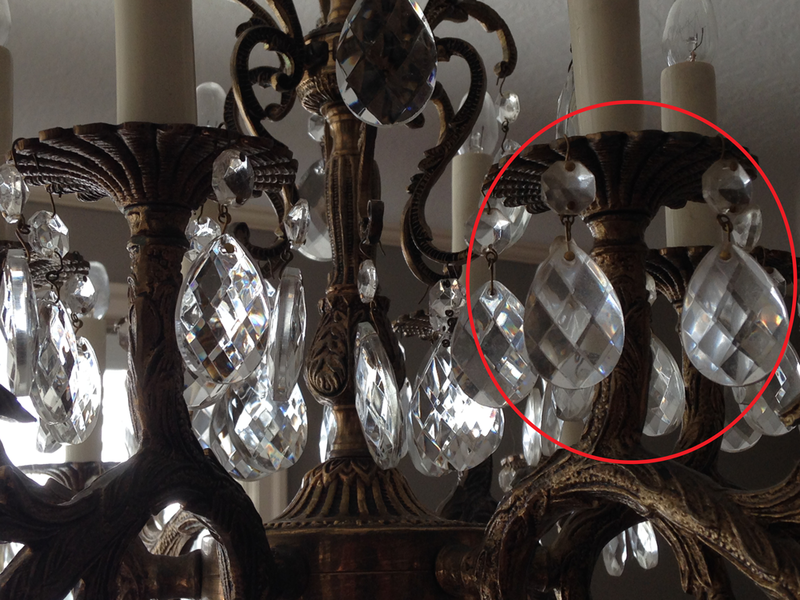 I also swapped out the almond-shaped crystal that had been tied to the center for the big sphere crystal instead. 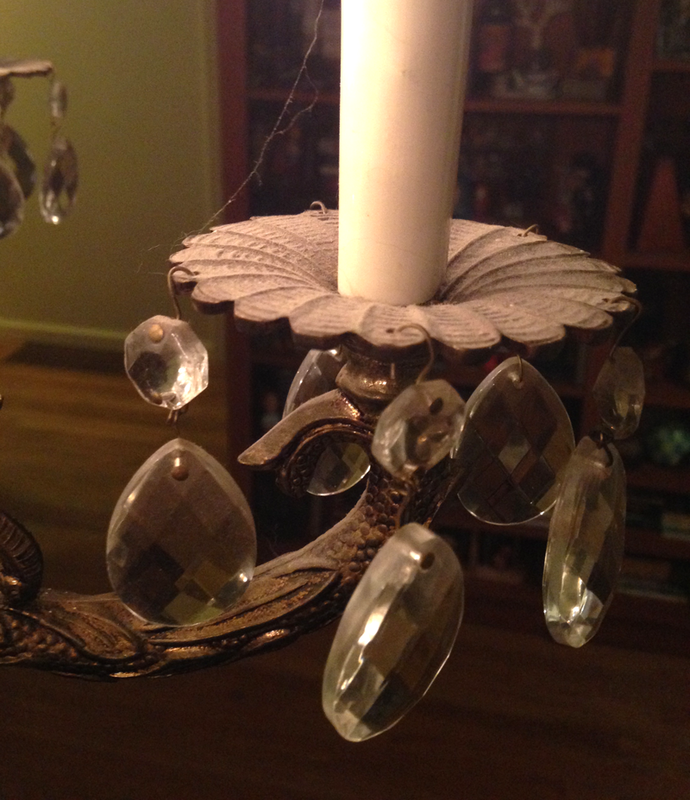 This chandelier didn’t have a hole to hang the center crystal but I really wanted it on there so I used brown thread and tied it securely to the base. Thread was the best choice after several test runs, it was the least visible. I really like how the focus is on the chandelier itself now that the excess crystals are removed from the swag. I packed those away in an egg carton in case I ever need a replacement. No longer storage for extra crystals. 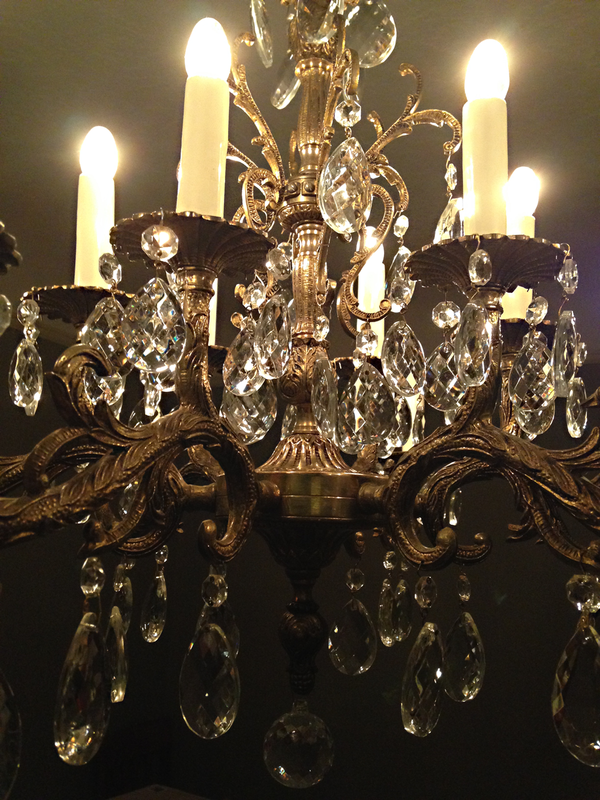 I read that you should give your chandelier a good thorough cleaning once a year. In between washes, use a feather duster to gently sweep away the dust on a regular basis. Here is a final picture of the finished chandelier which I also lowered a bit to allow it to be part of the room and not crammed against the ceiling. I find myself looking at it every time I walk by because I can’t believe how sparkly it is!